Lynwood House is situated near the Fal river at the very edge of Tregony village. Historically, Tregony is known as the ‘gateway to the Roseland’. The exceptionally wide main street of the village is a relic from the days when Tregony was a busy port. Nowadays the river has silted up, but the village is still attractive and the unusual wooden gallery on the 17th century almshouses can’t fail to catch your eye as you drive through. After the river at Tregony was blocked by silt from the china clay and tin streaming works near St Austell, small quays were built at nearby Ruan Lanihorne and silt dredged from the river was used to make bricks in the factory here. 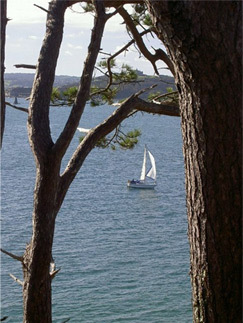 The Fal river is a popular place for bird watchers and there are some lovely riverside and woodland walks in the area. The road divides at the bottom of the hill by Lynwood House, bearing right towards the main Truro road and the wider world, or left into the heart of the Roseland Peninsula. Well known for its countryside and quiet beaches, the peninsula has impressive coastal and river scenery and picturesque villages. Ultimately this road reaches the sea and St Mawes, a one time fishing village which is now a picturesque little harbour full of sailing boats. There are boat trips to various destinations and a passenger ferry that crosses regularly to Falmouth on the other side of the Fal estuary. For heaps more information on the Roseland please click Saint Piran’s Flag. The banner of Saint Piran is a vertical white cross on a black background. Saint Piran is supposed to have adopted these two colours from seeing the molten tin spilling out of the black ore in his fire. This occurred during his supposed discovery of tin in the sixth century thus becoming the patron saint of tin miners. 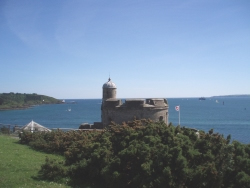 Basically you will discover lots to do and see on the Roseland and the weather will doubtless be better than expected due to the microclimate that exists on the peninsula. P.S. 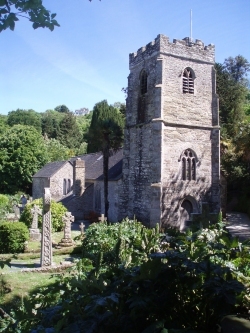 Be sure to visit the adorable waterside church of St. Just in Roseland, a mile before St. Mawes which dates from AD 550. Abigail and Jeremy were married there. Please click here to find links to information on the surrounding beaches, restaurants and travel.